The Pacific parrotlet (Forpus coelestis) is native to Ecaudor and Peru. Other names for Pacific parrotlets include Lesson’s parrotlets & pocket parrotlets because they can fit in your pocket. The Pacific parrotlet is also known as the celestial parrotlet. The “coelestis” part of the Pacific parrotlet’s scientific name means “heavenly” in Latin. Pacific parrotlets are small, measuring between 3 – 5.5 inches (7 – 13 cms) in length and weighing between 24 – 32 grams. Don’t let their size fool you. Pacific parrotlets have big personalities and can be aggressive towards much larger birds. Pacific parrotlets are known to be fearless. Pacific parrotlets have stout bodies and short tails. Their natural colours are grey and olive feathers with a green face. Male Pacific parrotlets have blue feathers behind their eyes. Most females lack these, but some have faint blue streaks. Selective breeding has created many different colours of Pacific parrotlets, including green, blue and lutino. 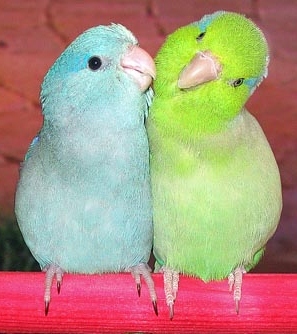 In captivity, Pacific parrotlets do well on their own but they can enjoy being with another Pacific parrotlet in a pair. Because they’re feisty, Pacific parrotlets in captivity should be kept away from other species of birds to avoid fights. Pacific parrotlets in captivity should be properly socialized from a young age or they can become unruly. Pacific parrotlets aren’t noisy birds. They don’t squawk and their chirping is fairly low volume compared to other birds. Because they aren’t noisy Pacific parrotlets can be good companions for apartment dwellers. They won’t bug the neighbours. They’re parrots, but Pacific parrotlets aren’t great talkers. But they can learn to say some simple words and phrases. Pacific parrotlets are tiny bundles of engery. In the wild, they fly, forage and dodge predators every day. In captivity, Pacific parrotlets are just as active as they are in the wild. They love play time with their families. Pacific parrotlets in captivity are also very affectionate with their families and will sit in your shirt pocket. Pacific parrotlets in captivity need bird-safe toys to play with to prevent boredom. Because of their high energy, Pacific parrotlets in captivity may need more food compared to other birds their size. With proper care, Pacific parrotlets in captivity can live an average of 12-15 years, but some reports have them living as long as 30.